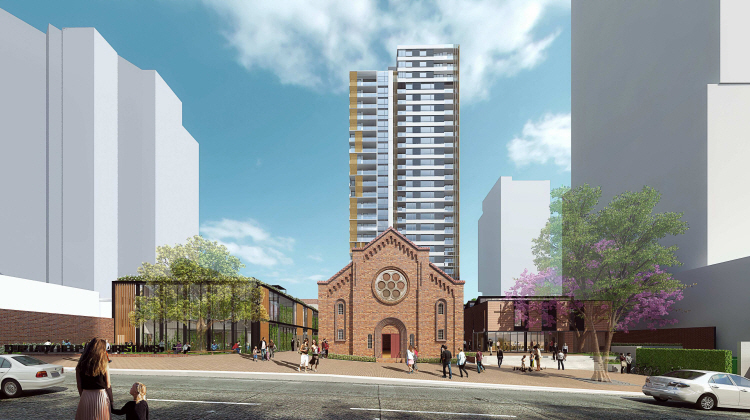 Parramatta City Council has put on exhibition this DA for a major development on the site of Our Lady Help of Christians, fronting Oxford Street and Cambridge Street, Epping . You can read the details here. The proposed development is for three major buildings on the site. Firstly, a new primary school building fronting Oxford Street, and replacing the current school at the back of the site. There is provision initially for one class per year, but this could be extended later to two classes. The second element is a new parish hall and office on the right of the Church, where the current priest's house is located. 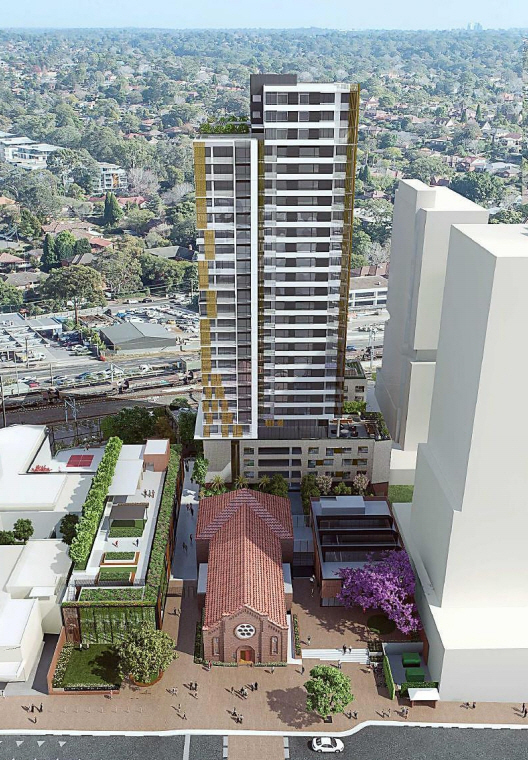 The third element though is a very large tower (29 storeys) behind the church encompassing basement car parking, a number of floors of aged care (132 beds), and then floors of retirement living units (205 units) - essentially a residential apartment development. At 96.5 m tall, the tower exceeds the Local Environment Plan maximum by 34%, and at that, it will be the tallest building so far to seek approval in Epping. It will set a new precedent for future buildings in Epping. As a consequence of the building height and bulk there will be increased wind speeds and turbulence around the development. The adjacent buildings between Cambridge and Oxford Streets will also be overshadowed in winter from late morning. The increased number of dwellings achievable by this high tower will further contribute to the appalling traffic gridlock that the Epping Town Centre Traffic Study has shown will occur in the next few years. There are other technical aspects about the tower development to which we will be calling attention. For example, the height of the proposed podium facing Cambridge St, and the size of the floor plate both exceed planning limits. And solar access to some apartments is less than required. And there is inadequate deep soil areas for tree planting around the development. The effect of construction noise and disruption to traffic in Oxford St and upon Arden School during building works are also concerns of the Trust. There are other ways in which this DA has been carefully thought through - the heritage value of the Church and its street frontage on Oxford Street is preserved, and the landscaping in this area should enhance this. The Trust has also lobbied the Church to make the parish hall available for hire by local community groups as there is less and less low cost community space available in Epping. The Trust will be submitting its objections, but while it represents several hundred members, the Trust’s submission will count as a single objection. If you share our concerns, please submit your own objections to City of Parramatta Council. You can find email them at council@cityofparramatta.nsw.gov.au or post a submission to City of Parramatta, PO Box 32, Parramatta 2124. You need to include your name and address, and the DA number - DA/586/2018 in your submission. The closing date for Submissions is 26th September 2018. You need to clearly set out your concerns.